Every year, Big Sis's school has a Hat Day Parade. 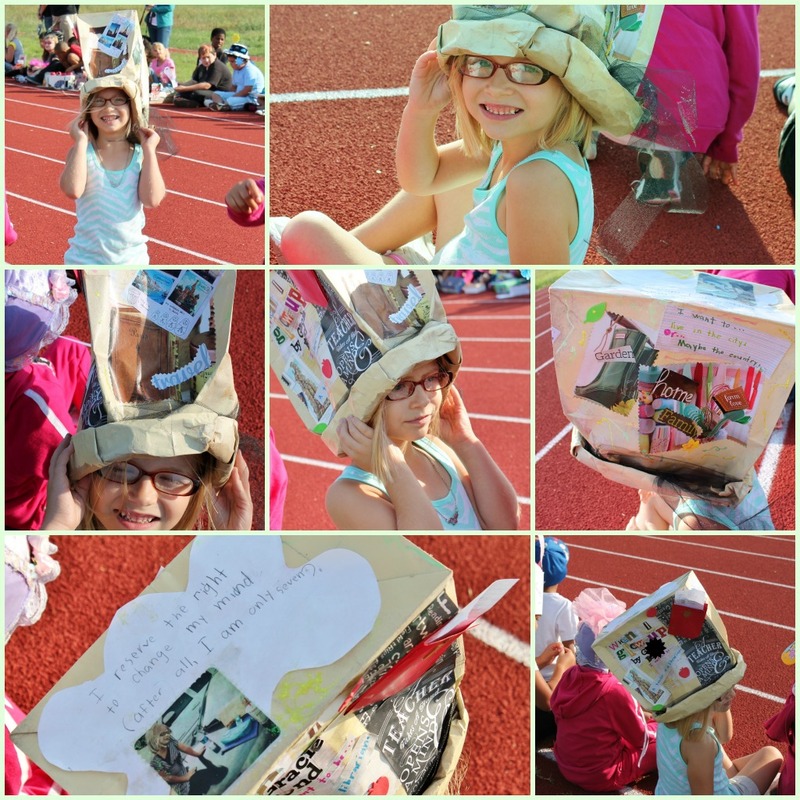 The kids and their families make hats reflecting that year's theme. This year, the theme was "When I Grow Up." We made her hat out of a brown grocery sack. I rolled up the bottom of the bag to be the brim, then the hubby sprayed it antique white. Then Sis and I decorated it, then sealed it with Modge Podge. Big Sis wants to be a teacher or librarian - for now. She says she will dance and do theatre for fun, and she will travel (especially to Paris) and live in a farmhouse in the country. Or maybe she'll live in the city. She's undecided. This is so cute! I love the hat and the aspirations it represents! Glad to have found your blog and your pinterest boards! Oh I love this! What fun pictures!! super duper cute! Thanks, Melissa! It was a cute event. Our hat was rather plain compared to some of the hats. There was one hat made entirely out of Legos! I LOVE her hat especially "I reserve the right to change my mind." 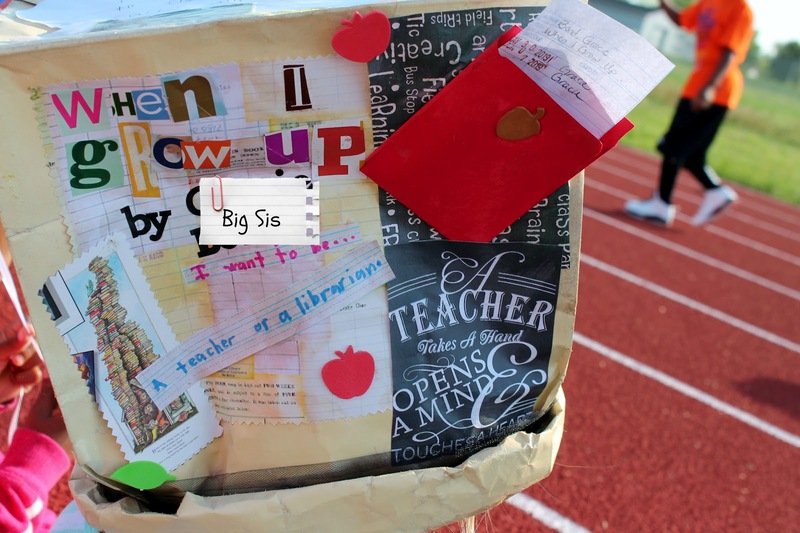 And I love that her school does this - what a great idea! It's a fun project. I don't know where it came from or how long they've been doing it, but it's very cute! She used to say she wanted to be a doctor. Not just a doctor, but a "baby doctor. I want to help mamas have their babies." My OB/GYN with my second-born was a younger, very attractive woman. I think she made an impression, when Big Sis would accompany me for appointments. Then she wanted to be a veterinarian, but to be honest, she's afraid of animals that aren't cats. Librarian or teacher seems to fit her personality more. That is a GREAT hat! Thank you so much for sharing this awesome project with us. I'd love to do this with my daughters. What fun! Thank you, Tara. We made several for Big Sis's Alice in Wonderland party a couple years ago. It's originally a Mad Hatter design. I got some great pictures of all the little ones at the party trying them on. It's a very easy project.